Wine Review Online - Léoville-Poyferré: Another Super Second? A vertical tasting of 15 vintages of Château Léoville Poyferré paired with food at the French Embassy in Washington, D.C. earlier this month was proof that this venerable St. Julien property is on the rise. 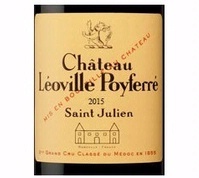 And while Cru Classé Bordeaux is never inexpensive, recent vintages of Léoville Poyferré are well-priced, especially compared to neighboring Château Léoville Las Cases. This is a property whose wines are worth following, not only for their intrinsic worth, but because it is a “super second” selling for less than super seconds’ prices. One virtue of a vertical tasting is that it allows you to see how the wines develop over time, which, in turn, helps us determine when they are ready to drink, though that also depends to a certain degree on individual taste. For me, the wines from Poyferré, like any of the top Cru Classé, need at least 10 to 15 years to show their glorious complexity and make the transformation from fruitiness to those magical non-fruit (leathery, cedar-y coffee-like, describe-them-as-you-like) flavors. A vertical tasting also allows you to discern changes in style, which, in this case, were easy to see, starting with the 2010 vintage. The disadvantage of a vertical tasting is that some delicious wines, such as the 2002 Poyferré, while delightful on their own, get overshadowed in comparison to others, such as the 2001, which was, itself, overshadowed by the simply glorious 2000 Poyferré. The takeaway message for me from the tasting was how much more elegant the wines have become, beginning with the 2010. They seem less extracted and therefore convey more finesse. The 2010 Poyferré, which to me was one of the stars of the night, had an impressive elegance along with the opulence for which Poyferré has become known. Far more expressive and refined than the ripe and intense 2009, the 2010 had an exciting sleekness (97 pts; $212*). Several other participants told me they noticed the same change. And subsequently, a winemaker at another prominent property in St. Julien told me he had perceived the same stylistic enhancement after tasting recent vintages of Poyferré. In the 17th century, the three current Léoville estates--Léoville Las Cases, Léoville Poyferré and Léoville Barton--were one property. Over the years, through revolution, inheritance, and sales, the original estate was divided into the properties as we know them today. Although all three estates were classified as Second Growths in the Médoc Classification of 1855, the market classification as measured by current retail price puts Léoville Las Cases significantly above the other two. According to wine-searcher.com, the average price for the 15 vintages we tasted for Léoville Las Cases was $257 compared to $155 for Léoville Poyferré and $134 for Léoville Barton. The Cuvelier family, who also run a successful wine-merchant business established in 1804, purchased Château Léoville Poyferré and a neighboring St. Julien property, Château Moulin Riche, in 1920. But the transformation of the estate started with the arrival of Didier Cuvelier to manage it and Moulin Riche in 1979. Sara Lecompte Cuvelier, the current General Manager who replaced her cousin, Didier, after he retired in August 2018, summarized Didier’s accomplishments succinctly by saying, “He did everything. He modernized the winery and upgraded the vineyards at both Léoville Poyferré and Moulin Riche.” Cuvelier hired Michel Rolland as a consultant in 1994, which was revolutionary because it represented the first time that Rolland, a renowned Right Bank consultant, would consult on the Left Bank. He continues to consult, visiting several times a year to help decide on the harvest dates and the blend. Lecompte Cuvelier, who presided over the recent Washington tasting, described the changes Didier made in 2010 that, to me, explained the dramatic difference in style of the wines. They replaced ten 216-hectoliter (hl) vats with 22 smaller (30 to 160 hl) vats, which allows them to vinify the best plots separately. She emphasized that parcel-by-parcel vinification gives them far more control over creating the final blend, deciding which wines will make the cut for the grand vin, which comprises only about half of Léoville Poyferré’s production. These double walled-stainless steel vats also allow them to perform pre-fermentation cold maceration, which allows them to extract flavor without astringent tannins, as well as to control temperature perfectly during fermentation. I believe it’s this precision in vinification, which leads to fine-tuning the blend, that explains the leap in elegance in the wines staring with the 2010 vintage. The other half of Léoville Poyferré’s production--those less elegant batches--goes into Moulin Riche or into Pavillon de Poyferré, which, starting in 2009, is the true second wine of both properties. Moulin Riche was the second wine of Léoville Poyferré until 2009, by which time the vines Didier had replanted in the 1980s were mature enough to produce fruit worthy of the property and reflective of its terroir. That’s when Didier decided that Moulin Riche could finally stand alone again. It had been classified as a Cru Bourgeois Exceptionnel in 1932, but no longer carried that classification since it is vinified at Léoville Poyferré and the regulations for Cru Bourgeois require the wine be vinified at its own château. Léoville Poyferré’s 145 acres of vineyards sit on gravely well-drained soil near the Gironde River and are planted to Cabernet Sauvignon (65%), Merlot (25%), Petit Verdot (8%) and Cabernet Franc (2%). The blend of the grand vin changes every year depending on how the different varieties do during the growing season, but it is always Cabernet Sauvignon dominant (55 to 65%) with Merlot representing 25 to 35%. Poyferré has a relatively large amount of Petit Verdot, which they are replacing with Cabernet Sauvignon and Cabernet Franc, according to Lecompte Cuvelier. She explains that Petit Verdot has a very short window for harvest--one day it’s under ripe and two days later it’s over ripe--which makes it a challenge to harvest all of theirs at precisely the right moment. She says they are not planting more Merlot because they find it is getting too ripe as climate change continues to have an impact. In addition to the 2010 Léoville Poyferré, which Lecompte Cuvelier felt was a “baby wine, with great potential,” there were many other stars shining at the tasting. The 2015 was opulent, yet precise, elegant, and structured. To me, it was like the 2009 only with better structure (96; $117). If I were buying young Bordeaux to cellar, this would be one of them, especially since Zachy’s in Scarsdale, NY is selling it for $85, according to wine-searcher.com. From a “forgotten vintage,” since it was eclipsed by the 2015, the 2014 was more delicate. Elegance and purity balanced its plumy profile. Although lighter in style, it still needs years for its complexity to show (90, $81). Lecompte Cuvelier described the 2012 as a “pleasure vintage, easy to drink while you are waiting for the 2009, 2010, and 2011 to mature.” I found it ripe and forward, perhaps a touch simpler than the others, but only in comparison. It would have shown better by itself rather than in this company (90, $90). The 2011 was another overlooked vintage, falling after 2009 and 2010, two highly acclaimed ones. The elegance and purity first apparent in the 2010 is equally apparent in the 2011, the first year they used an optical sorting device to select only the very best grapes for the grand vin. I think it will develop beautifully and surprise us all in another decade. (92, $87). This is another one I’d buy for the cellar. The opulent, almost massive, 2009 (93, $296) will be embraced by those who love that style while the 2008 was more classically framed and still youthful (90, $107). The trio of 2006 (91, $100), 2005 (92, $148) and 2004 (90, $108) were all robust wines, with the 2005 showing the most sleekness. Similar to the 2009, those who look for power will gravitate to this wine. All three need a few more years to show more complexity and finesse. With lovely acidity and verve to balance its ripeness, the 2003 (92, $182), from a very hot vintage, was a surprise of the night. As noted at the beginning of this article, the 2002 (92, $103), with subtle herbal notes and delicious by itself, was overshadowed in comparison to the superb 2001 (93, $99). Those looking for a mature Bordeaux for tonight, should run out and snap up any remaining 2001 they can find. The expansive-on-the-palate 2000 (96, $235), as marvelous as it is now, still needs a few more years to unfold. The 1990 (96, $364) showed the importance of vintage. Made at a time when there was little or no parcel-by-parcel vinification and little temperature-control during fermentation, the 1990, from a highly acclaimed vintage, has turned out to be a great wine showing both power and elegance. Though Lecompte Cuvelier is now fully in charge, she plans no substantial changes to the viticulture, the winemaking or the wine, opting to continue the work her cousin started, always trying to achieve the highest quality possible. This tasting tells me they’re on the right tract and well on their way to regaining their lost status. *All prices are derived from wine-searcher.com.